His candidate, incumbent Sen. Luther Strange, got crushed by 10 points in last night's Republican primary in Alabama. So McConnell's narrow majority will now include someone he doesn't respect, and who doesn't like him. More incumbents are now likely to face primaries, including Sen. Roger Wicker of Mississippi, making it vastly more expensive to preserve the majority. Sen. Bob Corker of Tennessee, chairman of the Senate Foreign Relations Committee, yesterday announced his retirement in "another blow to the Republican establishment" that will likely touch off "a highly contested, ideologically driven primary," per the WashPost. McConnell is crossways with a president of his own party, who is fed up with what he considers the Senate leader's archaic style. 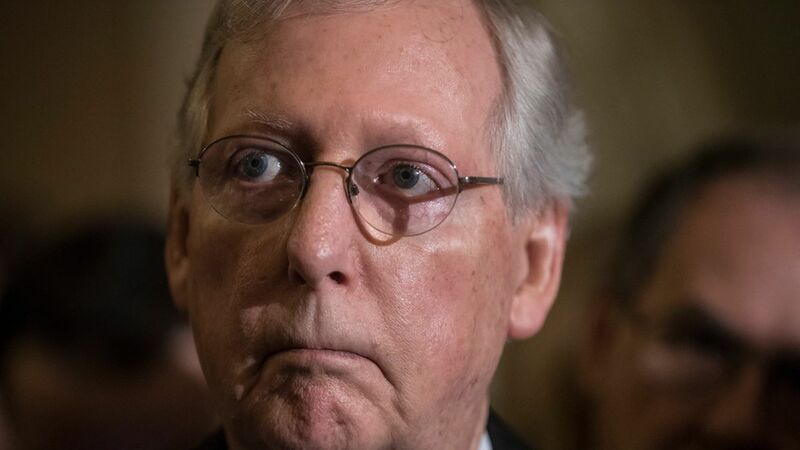 A poll back home in Kentucky last month gave McConnell an 18% favorability rating, making him one of the nation's least popular politicians. A longtime McConnell adviser tells us last night's result "shows his colleagues he's willing to go to the mat for a guy who had only been there six months, despite taking on a huge amount of personal attacks." "He has a strong point to make to holdouts within his conference that Luther Strange paid the price for their failure to play as a team on health care." "No question the road will get tougher before it gets easier, but McConnell does better in adversity. He won't spend any time wringing his hands. He'll be focused on tax reform like nothing happened last night." Be smart: The Republican establishment is so weak that even when it has Trump on its side, as it did in Alabama, it can't beat the Trumpers.